Maggie and I were just talking on the phone. She was telling me about the San Sebastian celebrations in Ciudad Rodrigo today and whilst we nattered she laughed about the storks sitting on the convent wall just opposite her flat. 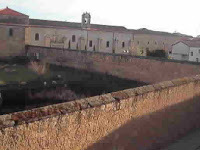 The pictures a bit grainy but you can see the convent, the sheep and the storks so it does the job. A bit late I know but Maggie showed me this picture of her, and some of her charges at her school in Ciudad Rodrigo, as they prepared for Hallowe'en. Lovely eh?